What is an ‘earth resource’ and why does it matter to Victoria? A new snapshot of the industry details the answer, as well as other lead findings from the sector. When people focus on mining, rather than Victoria, they’re more likely to think about Western Australia or Queensland. While Victoria may be a relatively small-player on a national mining scale, it’s expanding fast. Recent Australian Bureau of Statistics data shows mineral exploration expenditure in Victoria is growing at a higher rate than other states, increasing 33 per cent to $24.5 million from March to June 2018, compared to six per cent growth for all of Australia over the same period. Earth resources are drawn from the earth and include brown coal, gold, base metals, quarry materials and mineral sands. 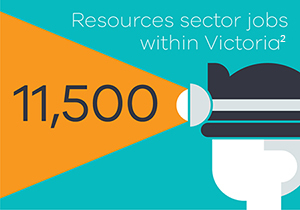 Combined, these resources add up to what is a vibrant sector for Victoria, and one which continues to make a handsome contribution to the economy. Many of these materials are used in the technology devices most of us use every day or for the electricity powering them. In recognition of this, the Victorian Government has developed a new report to support investment, growth and improvement within the sector. Entitled ‘Earth Resources Sector Indicators’, it is the first published report on data from the 2016-17 financial year applicable to Victoria’s earth resources. Among the findings, it highlights 57.4 million tonnes of metals, mineral sands, gravel and crushed stone were extracted to support Victoria’s $44 billion construction industry. 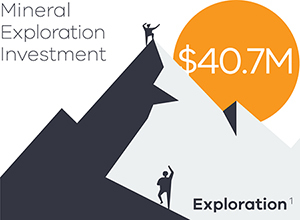 mineral exploration expenditure increased by 30 per cent from $29 million to $41 million. In the past eight years earth resources sector employment has ranged between 8900 and 13,800 annually. Approximately 45 per cent of these jobs are outside greater Melbourne in rural and regional areas. Minerals include gold and precious metals; base metals including copper (which is widely used for electric wiring); antimony (used as a fire-retardant additive); mineral sands and rare elements; and coal. 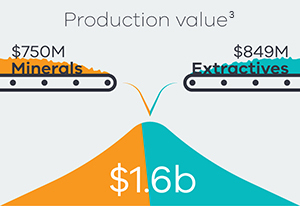 Victoria’s range of extractive resources are used for agriculture, building and construction and include basalt, hornfels, granite, sand, gypsum, kaolin and fine clay. Higher building activity leads to higher demand for quarry materials such as sand, stone and gravel. Building and construction activity are important sources of economic activity and employment growth for Victoria. Access to high quality and accessible extractive mineral resources is essential to support future construction activity and related employment activity. The full Earth Resources Sector Indicators report is available on the Earth Resources website. 1. ABS publication series 8412.0, Minerals and petroleum Exploration. 2. As at May 2017, ABS publication series 6291. 4. ERR Statistical report 2016-17, Page-11. 5. This figure is from ABS Series 8755.0 and includes the construction of new buildings or structural alterations, extensions or other additions made to existing buildings. Page-16.